My mother is a firm believer in signs from other worlds. Explosions of light, pennies from heaven, the kingfisher that speaks a warning before people die. I don't believe. Or I think I don't. Or I don't want to. Maybe a little of each. The day of the surgery to remove the tumor from my mother's spine, my family mostly eats and waits. Breakfast, then waiting in the lobby, where there were plenty of chairs but not enough comfortable ones; then lunch, then the uncomfortable chairs again. Hour after hour of shifting uncomfortably, changing places, wandering nearby hallways. Trying to make sense of the fragments of information we've been given over the past few days. Leaning in around my brother's laptop, google-searching for images of spinal fusion, vertebrae destroyed by tumors. We wait for the surgeon, for the recovery room, for the transfer to ICU, for per mission to go in and see her. Finally, in the ICU, with its new waiting room and uncomfortable grouping of chairs, we rotate in and out of her room in pairs. After waiting all day to be with her, I'm not sure what to say when I see her lying in bed with blood on her forehead. I pick up where our last phone conversation left off, tell her that M's favorite bedtime story this week is The Best Nest. Alone in the room with her, I sing the little song from the book, the words catching in my throat. When I cross the hall back to the waiting room, the chairs have emptied out, except for a large Amish family, women in bonnets, men with long beards. They're speaking another language: German? Dutch? They appear to be settling in to spend the night. I can't stay. I put on my coat, hat, gloves, find my parking ticket, leave my dad and brothers and the Amish behind, and drive the highway home. Snow falls softly. The older girls are asleep, but as I step in the door and whisper hello, the baby cries out and M rushes to hug my legs. I hold them together on my lap, baby nursing, little girl almost asleep, chatting drowsily about the events of her day. I think about my mom, sleeping in the hospital bed, the bandages, the wires, the machines beeping steadily, the cage holding bone graft in her spine. I don't know what will come next, but I am afraid of it. I love you mama, my little girl whispers. I kiss her sweaty, tangled curls, and hear the baby's deep sigh as he drifts to sleep, and whisper I love you again. As I say it, I realize: this is how my mother loved me when I was small. This full-throated, whole-hearted, visceral love, love that knew the smell of my hair, and the weight of my small body nestled onto her lap, and the size of my hand in hers. This is how my mother loved me when I was small. Later, I message a friend; How is your mom, she asks, How are you? Still caught up in that moment with my daughter, I tell her, I think I felt the universe move through my body. The words seem ridiculous, both in their grandiosity and their inadequacy. There is no way to explain that moment that doesn't feel like I am both oversimplifying and overreaching. But I can't stop thinking about it, the rush of energy and grief and beauty. When I was a little girl, I believed in ghosts: I loved the true story collections about doors opening and closing, small children in old fashioned clothes appearing at the foot of someone’s bed, the sudden chill in a room on a lovely summer day, the foggy shape in the corner of a photograph. I couldn't stop reading, but I lay awake at night, terrified that a presence would emerge in my room. I tucked myself in tightly, slept with the door open and the hallway light on, wished I were brave enough to look under the bed to reassure myself that no one was there. Maybe I'm still that little girl, afraid of a force colder and swifter than she can see. 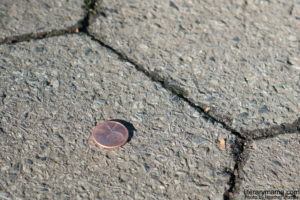 Maybe I'm worried that my mother will send me a message and I won't get it: a penny I'll step over on the sidewalk, a bird who will speak in a language I don't understand. Maybe the kingfisher has already signaled that her time has come, and I'm holding on to a future that's destined to slip away. I tried to warn you, the bird says, before spreading his wings and diving into the river, disappearing into the dark water, then breaking the surface, returning to his perch to gulp down a silvery fish. The cancer keeps growing, spreading, setting up shop in new locations in her vertebrae and skull. She talks about an Alaskan cruise, a month in Florida, a trip to the Carolinas to see my aunts. Baby grows into toddler, stumbling, then running, then shouting incoherent but joyful commands at his sisters. The fish dies, and we have an elaborate funeral, and we get a new one; then that fish dies, and my oldest daughter D says, Now that I've experienced death once, I think I handled it better this time. She turns 9. We get a third fish. My brothers and sisters and I take turns traveling with my parents to talk to doctors across the state and then across the country about trials and treatments and surgeries. No one talks about cures. I don't go to church, or pray at bedtime, or say grace before meals, but in the moments when my family has had to confront death directly, I can never bring myself to say that at the end of the story we are bodies cold in the ground. I created a kind of secular heaven for my girls to imagine, instead of the darkness of grief: beautiful souls in a sunny garden, living their best day forever. Secular heaven is vague but comforting, and their questions are mostly logistical: Are all the kinds of places on earth in heaven, like deserts and forests and beaches and frozen worlds like Antarctica? Do you only meet people you knew on earth there, or can you make new friends? Are dogs and fish in a separate part, or are they mixed in with the people? Now D has developed a fascination with space and science, so we read about the big bang, exploding stars, the cosmos. We curl up together under her blankets, reading about the way energy moves through the universe, never created or destroyed, just endlessly changing form. All of us made of starlight. She pauses, lingering on an image from deep space, nebula and starshine and foggy galaxy bright against endless deep purple. Is that heaven? she asks. Not space, but the energy. I'm not sure, I say. But it's beautiful, isn't it? She nods, quiet. I can't tell what she's thinking. I imagine the flash of a penny on the sidewalk when the sun strikes it, the kingfisher's wings slicing through sky and water and sky again. Jennifer Jameslyn writes poetry and memoir. She’s doing her best to raise children who love wildflowers, travel, books, and Star Wars.